Huawei P Smart 2019 is a mid-range device with outstanding features that can easily attract users' attention. From the seamless performance to camera and battery backup, the device has no signs of any shortcomings. The display will serve as a pleasure for the user's eyes. If the budget is not a problem, this device may be a good choice. 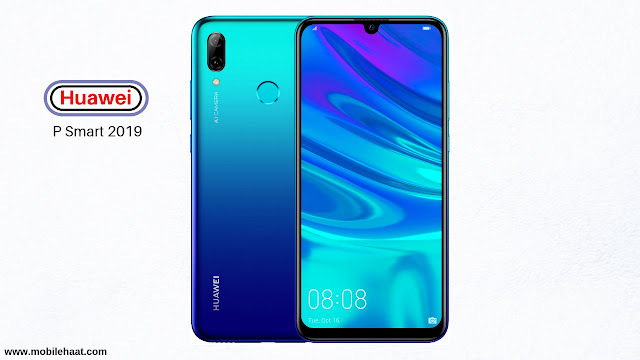 The Huawei P Smart 2019 features a 6.21-inch IPS LCD display with a screen resolution of 1,080 x 2,340 pixels for immersive visuals. The 415 PPI enhances display quality and ensures the clarity of the video. Under the hood, it is provided by an eight-core (2.2GHz Cortex A73 quad-core 1.7GHz Cortex A53 quad-core) processor set up on the HiSilicon Kirin 710 chipset. It provides very good performance and is further aided by the Mali-G51 MP4 GPU, which supports graphics. There is a 3GB RAM that can handle multitasking of devices. Smartphones can impress users with their excellent cameras with 13MP 2MP lenses, providing an amazing photographic experience. On the front side, there is an 8MP lens that allows the user to click on the selfie, with high definition and brightness. In order to store the user's files and data, there is a 64GB of built-in storage that can be further extended to 512GB through the memory card. The Huawei P Smart 2019 is equipped with a lithium-ion battery and has a capacity of 3,400 mAh. It can supply power to the device for a long time with one charge. It also has a fast charging feature that helps users recharge in a short amount of time. For connectivity, it has Wi-Fi 802.11, mobile hotspot, Bluetooth, GPS with A-GPS, micro USB 2.0 and more.